Adirondack chairs, ideal for lounging in the garden, if the weather ever gets any better. 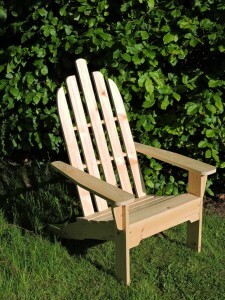 I have been making a series of Adirondack chairs as I love the style and comfort. They also look great as a sculptural object in the garden and improve with age. I sell them either treated or untreated and have found a really great organic stain from Osmo. It is translucent so you can still see the grain but seems very water repellent. This picture shows an untreated chair in Pine but they are also available in Scottish Larch. Previous PostWhirlygigs and whimmy diddles, some new work for Open Studios.Next PostSuffolk Open Studios, garden chairs and whirligigs.